I've managed to get my hands on another long-lost personal development gem. This excellent book comes complete with indepth discussions on: which goals should I focus on; little-know goal setting strategies; goals setting Do's and Don'ts; and, time management considerations. You can pay hundreds of dollars to purchase comprehensive guides on how to establish goals, just like this one. But now I'm pleased to tell you that if you act immediately, I'll bundle it in with your purchase of Be Rich: The Science of Getting What You Want for just another $15 and you'll get access to both of the eBooks, plus the two other bonuses, in just a few moments from now. Now this is a real little gem and that's why I'm offering it up as the king of them all 'Platinum' upgrade. So what will you get if you opt for Platinum? Everything you've just read about on the main website, plus the GOLD Goal Setting Made Easy: Your Guide To Achieving Order & Balance eBook discussed above AND this timeless guide called "Stress Management: How To Break Free From A Stressful Lifestyle." It's pictured on the left, but is once again available to you as an eBook for immediate download when you opt for the Platinum package below. Learn how to identify the stressors in your life, eliminate those that can be removed, react positively to stress and alleviate stress in a variety of different ways without drugs. Stress manifests itself in many different ways and can be either self induced or something that occurs in life. 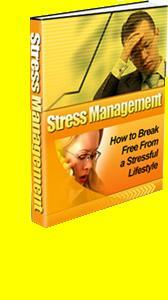 We can never eliminate stress from our lives as stressful situations are part of life. This book will teach you different tips as well as old secrets on how to identify the stressors in your life as well as learn to manage them. A must read! The Platinum upgrade adds just $19 to the GOLD price. This is your one-off opportunity to get all 3 eBooks (plus the two bonuses eBooks) at an absolute steal of a price. Grab the chance now. "Stress Management: How To Break Free From A Stressful Lifestyle"
"Goal Setting Made Easy: Your Guide To Achieving Order & Balance"
Don't have a PayPal account? That's no problem. Go ahead and click on the link of your choice above. When the PayPal page pops up, simply select the option which reads "Don't have a PayPal account?" You can then go ahead and enter your credit card details to secure your purchase..